We're Awakening! : BREAKING: Switchfoot's iTunes Session record will be available internationally on September 6! 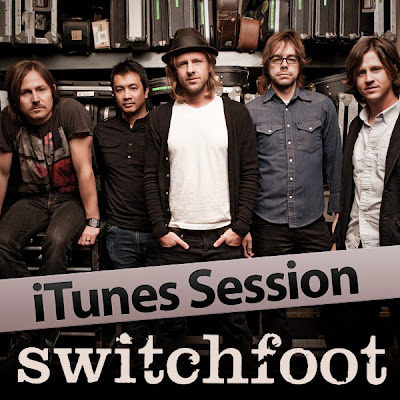 BREAKING: Switchfoot's iTunes Session record will be available internationally on September 6! That's right. Got word from management that all you international peeps will be able to download the awesome new Switchfoot "iTunes Sessions" record on September 6! Mark your calendars! Next, we have some chart stuff that I have obviously been slacking off on. It might have something to do with the fact there is very little in the way of movement this week. "The Sound" sits tight at No. 10 on Alternative Songs, despite an almost 100 spin increase from last week. "Your Love Is a Song" jumps from 39-38 on Adult Pop Songs, sticks at No. 16 on Christian CHR, and back up a spot to No. 20 on national Christian Songs. Another fun bit of chart news, the new "iTunes Session" album was (and as of now still is) the No. 5 Alternative Album on the iTunes Store, and "Hello Hurricane" has reached back up to No. 10 on that same chart, thanks to the $8.99 deal. The sessions disc also has reached as high as No. 22 on the overall albums chart, with "Hurricane" re-surging back up to No. 67. Needless to say, it's been a great week for Switchfoot! Billboard reports that Switchfoot's music and live video clips will be returning to ESPN during the 2010 college football season. Atlantic doesn't cease to amaze with the undying support for this band. So great.